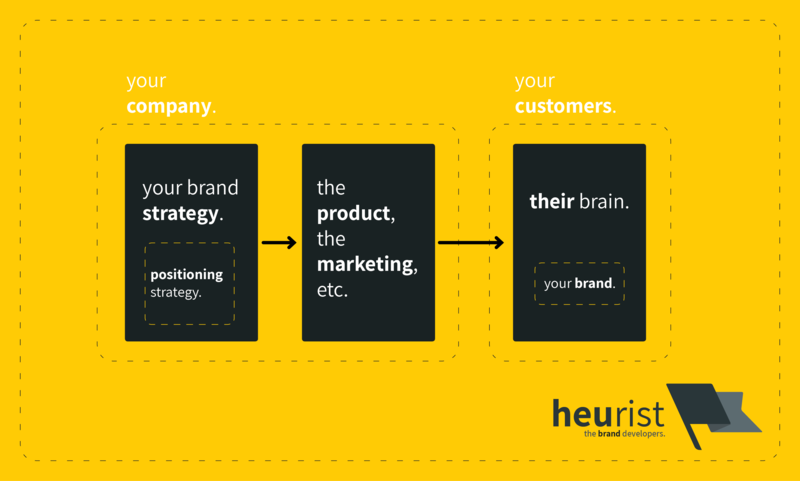 branding vs. positioning — Heurist - the brand developers. you are here: back home. › our-thoughts › the difference between branding and positioning. You often hear the two terms of 'branding' and 'positioning' interchanged, but there's actually a difference. This article breaks it down. With a diagram. Let's start with branding. What is it? Before I start, I want to make sure we’re on the same page. Let’s define what a brand is. Then we can look at what branding means. The process of branding is then the act of putting your brand onto something – be it a product or service, or whatever it is . branding is the act of putting your brand onto something. A brand, being a reputation, lives in the minds of customers . Customers have to mentally categorise things to remember them and recall them with ease . Basically, they want to be able to say “oh, that brand belongs in that category”. A brand’s position is then the category that it sits in (in the minds of its customers). Usually this position is relative to other brands’ positions. For example, both HP and Nikon make cameras, but people want to know where HP is in the same league as Nikon. HP might want to reinforce its position as being in the same league as Nikon, through the process of positioning its brand. a brand’s position is the category that it sits in (in the minds of its customers). This process of positioning involves creating that position in the minds of the customer. For an organisation or company to position its brand, it would have to communicate aspects about itself such as whom it competes with, what they share in common, what differentiates them, and so on. To summarise, a brand is a reputation. Branding is about sticking a brand onto something. Positioning is about helping customers categorise a brand. P. Kotler, K. L. Keller, and S. Burton, Marketing Management, 1st ed. Frenchs Forest: Pearson Education Australia, 2009. D. Kahneman and S. Frederick, “Representativeness Revisited: Attribute Substitution in Intuitive Judgment,” Heuristics and Biases, pp. 49–81, 2001. A. Murata, T. Nakamura, and W. Karwowski, “Influence of Cognitive Biases in Distorting Decision Making and Leading to Critical Unfavorable Incidents,” Safety, vol. 1, no. 1, pp. 44–58, 2015.